On May 16, 2009, VPR celebrated the successful completion of our Creating a Sound Future endowment campaign with an event at our Colchester headquarters. Joining us to help celebrate were NPR’s All Things Considered Host Robert Siegel and National Security Correspondent Dina Temple-Raston. 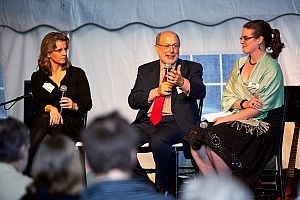 As part of the festivities, Vermont Edition Host Jane Lindholm interviewed both guests before a live audience.